E2S Warning Signals has introduced a SIL 2 version of its flagship BEx range of explosion proof alarm horn sounders and Xenon strobe beacons. 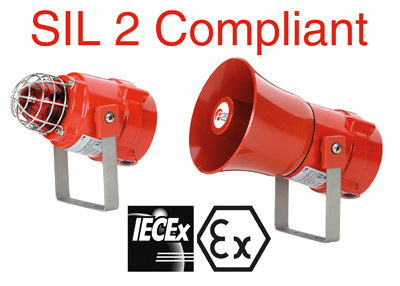 The new IECEx and ATEX certified BEx horns and strobes are the perfect solution for designers and integrators of SIL 2 systems; they are designed and tested to ensure a 99.9% reliability rate, bringing plant safety to new levels. To meet the requirements of SIL 2, a combination of software and hardware in the new units accurately monitors and interprets the sound output of the horn or the light output from the Xenon strobe to check it is functioning correctly. The fault monitoring reports back to the control panel utilising either separate fault contacts or by the introduction to the monitoring circuit of a series resistor. Using the series resistor facility eliminates the need for any additional cables and can be used in a standard two-wire arrangement.